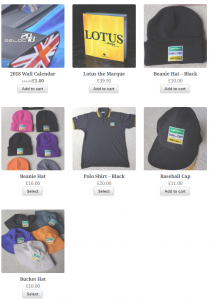 Just in time for Christmas, the SELOC Shop has just been updated with a new range of SELOC club hats, along with our redesigned polo shirt and the 2018 SELOC Calendar. Not only that, but we’re also pleased to offer Coterie Press’ excellent book, Lotus the Marque, for a SELOC special discount price of £39.95 including UK shipping. Stock on all these items is limited, so be sure to check them out and order soon to avoid disappointment. Don’t forget as well, the SELOC Slogan, and Sensible, mugs are still available – the perfect way to enjoy your finely crafted artisan coffee. This entry was posted in SELOC. Bookmark the permalink.